Just don't, friends. This album doesn't deserves a higher general rating than "Perfect Strangers" or "Fireball" to some extent. Honesty forces me to write this review, actually just for settling things rather than praising or bashing this nice effort, because, yeah, it is a nice effort considering what was happening with DP before this album. Blackmore had enough. We can all argue about who did the most for DP in the golden era, who resurrected DP in the silver era and what happened next. But Ritchie proved us two things in the last records: his mind was in other thing and he is human, after all, made of mistakes and bad decisions. Because "Slaves and Masters" is a total creation of his mind. And roughly "THOBL" and "TBRO" are, as well, mostly made of Blackmore's fretting, if any fretting at all. Yeah, "Perfect Strangers" is a masterpiece. But what about the others? Not precisely head-crushing albums. Maybe, just maybe, "The Battle Rages On" equals the greatness of Mark II in some ways. But to claim that "Purpendicular" is far better than "The Battle Rages On" or even "Perfect Strangers", that's a travesty!! What's great about "Purpendicular" is the fresh air. The thing that happened with "Burn". But hey, in "Burn" the times were different. The ages were different. The magic was still there. Here, the scars are visible. The scars still are hurting and despite the new inspiration which could have come with Steve Morse, the band was still taunted by the great loss that meant the departure of Blackmore. And I'll say more: they stayed taunted and haunted by that until the release of "Now What" and everywhere, everywhere, that could be smelled miles away. But hey, "Purpendicular" has many brilliancies. Indeed, Steve Morse proves how talented he is -from behind, though- and some riffs, specially in Ted the Mechanic, Loosen my Strings and The Aviator, he comes up with technicalities never-found in Blackmore's style. And that amazes us, shocks us to the core. A new sound, not leading the whole, but doing it from behind. That was the idea of Gillan, Glover, Lord and Paice. They didn't wanted "another Blackmore" with Satriani. They needed something else, different and pure. There's the point here and that's why Morse's appearance works perfectly for DP's idea. "Purpendicular" is a nice release. Not that "heavy", not that "majestic" in terms of having a remindable song like, let's say "Anya" for giving names. But has a new spirit, a new way of approaching things. Unfortunately, Blackmore's spirit was still there, haunting, lurking. And they just couldn't shake themselves off that until "Now What" as I said before. Despite this, a couple of good songs in this album are now part of Deep Purple's canon: "Sometimes I Feel Like Screaming" and "Ted the Mechanic" are good enough to share some duties with the band's classic. And many other instrumental sections here are just as good as the previous ones in former releases. Still, in this record, Gillan is far from his heights. Just like "The Battle Rages On" but even weaker, because here is no inspiration. Even the fresh air lacks to impress Gillan's voice to look for something else. And that's pretty much of it. Glover is cold, distant, making no great moves, just delivers the enough ammount. Only Paicey, in some moments, and Maestro Lord are up for the duty. Specially the latter. Maestro Lord charges on his back, again, the heavy weight of the band. And from behind, god bless you, Steve, for saving the band. Here, he still lies behind the mammoth, but his interventions and riffs were the thing for moving the ship after the fire. Overall, a good release. Not brilliant, just good. I've been a Deep Purple fan for a long time, but only recently got hold of this album. I suspect my situation is a similar one for many other Purple fans, who are no doubt familiar with the band's 70s material, Perfect Strangers, but have only come across one or two songs they've done since. As it happens, they've released a string of solid albums since Richie Blackmore's departure, of which this is arguably the best. Sure, you can really hear that Richie is no longer in the band, but Steve Morse really does do a phenomenal job of working with the rest of the classic MKII lineup. This album has everything. Ted The Mechanic, A Castle Full of Rascals, Hey Cisco and others have that typical organ-laden heavy Deep Purple sound, whilst other songs are a little more of a departure, in a good way. Sometimes I Feel Like Screaming is a true epic, and one of the best songs the band have ever done, Rosa's Cantina is surpisingly bluesy, and there's some folkish touches, particularly on the amazingly pretty The Aviator. It's not the heaviest album in the band's career, but it's possibly their most beautiful. It's almost as essential as Fireball, In Rock, Machine Head and Burn, and miles better than Perfect Strangers even if it lacks the obvious hits. There are few bands that can match the amazingly high standards of Deep Purple. Even Deep Purple themselves have had trouble keeping up to their own standard, but with "Purpendicular", they really demonstrated that they still are the true monsters of rock. The album really is one of their strongest ever, and Steve Morse injects an amazing amount of good ideas and a fierce energy that the band hadn't had since the early seventies. One can really hear what a great time the band had playing theser songs. The album opens with a heavy, pounding song called "Ted the Mechanic". This song would have been enough to save even the lousiest record. It's simply amazing. The riffs are great, the chord proggressions are well structured, the vocals are powerfull, and Steve's solo is as always amazing. This feel holds on throughout the entire album and there are moments here and there that are better than anything they wrote in the old days. The second song "Loosen my strings", is a great power ballad, with breathtaking dynamics, and again beautiful melodies, with great structures. The chorus is very uplifting and it stays in your mind. "Soon forgotten" is another example of a great, wild and fun side of Purple that one rarely sees. The organ work on this track is stunning and you are reminded why Jon Lord is regarded as one of the greatest keyboard players of all time. The album can feel more heavy and metallic than older records, but Steve's sound blends so well with the rest of the guys, you almost wish that he'd joined the band earlier. One of the greatest moments of the album is the guitar/organ solo in "I'm not your lover". It really stuns you. It's all just straight arpeggios, but it so good you can't believe it. "Rosa's cantina" is a groovy and very cool track, which starts out with bass and organ. It's got a nice funky feel about it and it's different in a fun way, not just the normal formula. The last three tracks however are the best. Just when you think that the album can't get any better, it does. "Hey Cisco" is a fast, heavy song. It has great solos and nice lyrics. Ian Gillan truly is a master of humorous lyrics. He can make any boring subject into something laughable, something he clearely demonstrates here. "Somebody stole my guitar" has the coolest riff on the hole album. Heavy, bluesy and groovy. The furious drumming from Ian Paice lifts the entire track and Roger Glovers bass has great tone. "The Purpendicular Waltz" is pure blues, with the Purple touch. Great lyrics, great guitars and great drumming. It's a good closing track and leaves you with a nice overall feeling of the album. 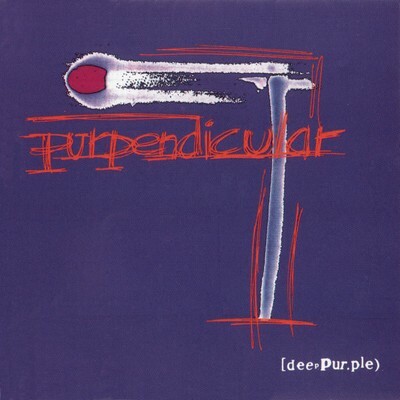 "Purpendicular" is a breathtaking album, which crushes all doubts about no more Purple after Blackmore. All the songs are well-written and have got all the riffs and melodies you could ever wish for. Suddenly Purple weren't this bunch of old, bored guys. They were Deep Purple. The true masters of all heavy rock. This album is essential for all hard rock and metal fans who like Purple.